1987 Authority, Leadership and Organization Conference, The Tavistock Institute Group Relations Training Program, U.K.
1987-1989 "Psychotherapy of Borderline Patients." Principal Investigators: John Clarkin, Ph.D. and Harold Koenigsberg, M.D. This study involved developing a therapy manual and rating instruments for therapist adherence and patient change. Co-Investigator; My 12% of the effort focused on the treatment contract. 1992-1994 "Psychotherapy of Borderline Inpatients." The Fund for Psychoanalytic Research of the American Psychoanalytic Association awarded $26,170. Principal Investigator: James Hull, Ph.D. This study explored the relationship between patient language in psychotherapy, symptom levels, and therapeutic alliance in hospitalized borderline patient. Co-investigator, 20% effort. 1992-1995 "Psychotherapy of Borderline Personality Disorder Patients." NIMH awarded funding of $206,106 in direct and indirect costs. 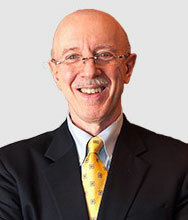 Principal Investigator: John Clarkin, Ph.D. This two year study compares the first year of a manualized psychodynamic psychotherapy of these patients to a cognitive behavioral treatment. Co-investigator, 10% effort. 1999-2005 "Randomized Clinical Trial for BPD Patients." Borderline Research Foundation awarded $2,000,000 funding. Principal Investigators: Otto Kernberg, M.D. and John Clarkin, Ph.D. Co-investigator and Director of the TFP cell, 6% effort. 2008-present "Psychological and fMRI changes in BPD Patients." Principal Investigators: Otto Kernberg, M.D. and John Clarkin, Ph.D. Co-investigator and Director of the Therapy Cell, 10% effort. 1997-present Lecturer, consultant and supervisor, Department of Psychology, Université Laval, Québec, Canada (part-time). 1999-2008 Lecturer, consultant and supervisor, The Munich Institute for TFP, Munich, Germany (part-time). 2000-2004 Lecturer, consultant and supervisor, The Hôpital Céry, Lausanne, Switzerland (part-time). 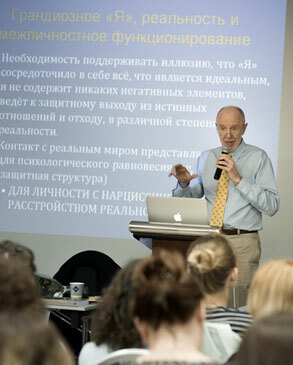 2004-present Lecturer, consultant and supervisor, The Österreichische Gesellschaft für angewandte Tiefenpsychologie und allgemeine Psychotherapie, Vienna, Austria (part-time). See separate page for Publications. 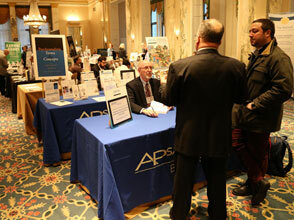 Dr. Yeomans signs latest (co-authored) book Transference-Focused Psyhotherapy for Borderline Personality Disorder: A Clinical Guide at the American Psychoanalytic Association meeting in January 2015. 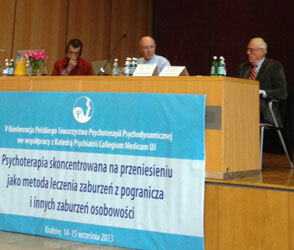 Dr. Yeomans presenting an Introduction to TFP with Dr. John Clarkin at the Polish Association of Psychodynamic Psychotherapy in September 2013. 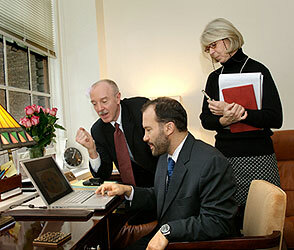 Dr. Yeomans reviewing programs with PSI colleagues Barry Stern and Jill Delaney. 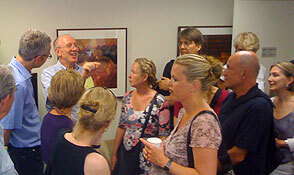 Dr. Yeomans welcoming international colleagues in July 2008.